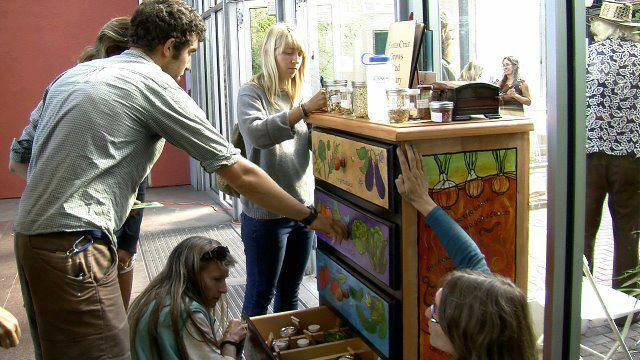 is a nonprofit public charity that offers low-cost sustainable living-skills education to the public. Our mission is to strengthen the reskilling movement locally by teaching skills, promoting skill-sharing for a resilient common future and enhancing the development of self-reliance in Santa Cruz County. Donations of any amount are appreciated and allow us to continue to offer our programs and services. 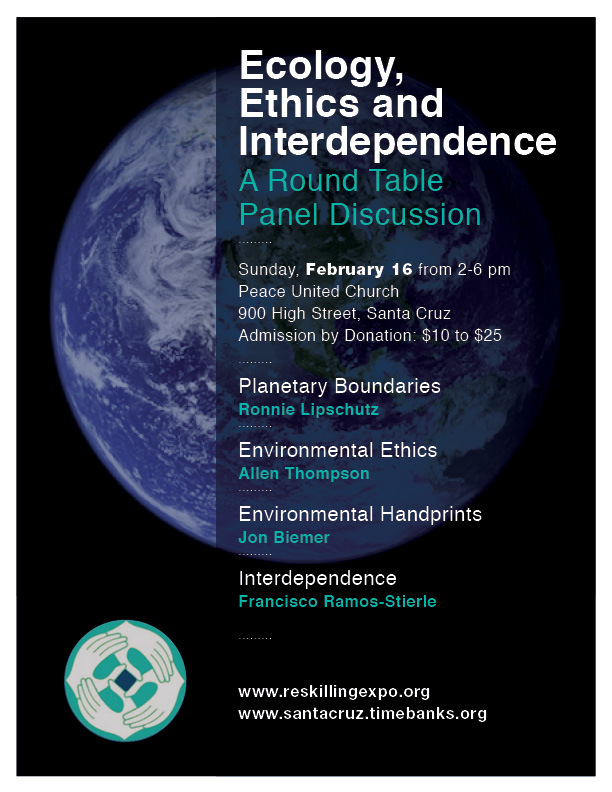 The PayPal account will say TimeBank Santa Cruz/Reskilling Expo. We'll continue to convene talented educators to teach best practices and local resilience. But we've changed how we deliver sustainable living-skills education. Instead of large, day-long events, we now offer pop-up reskilling workshops throughout the year through the TimeBank. The best way to be involved is to join the Timebank and reskill yourself there year-round. All classes are offered at no-cost to TimeBankers and at low-cost to non-members. Proceeds benefit the TimeBank. We reskill to rediscover hidden talents, to reclaim lost abilities, to unearth the wisdom needed to create sustenance and bounty. We reskill to restore, cherish and preserve our quality of life and our environment. Reskilling is a remembering, reclaiming and revivifying of skills that were known fifty to seventy-five years ago. Reskilling imbues the community with the wealth of shared local knowledge of how to do, make and tend things oneself. It is a regenerative, restorative and ecologically-based methodology. All reskilled individuals would know how to grow some food and harvest some rainwater. Reskilling suggests relocalization; it brings the production of food, water, energy and essential goods closer to home. 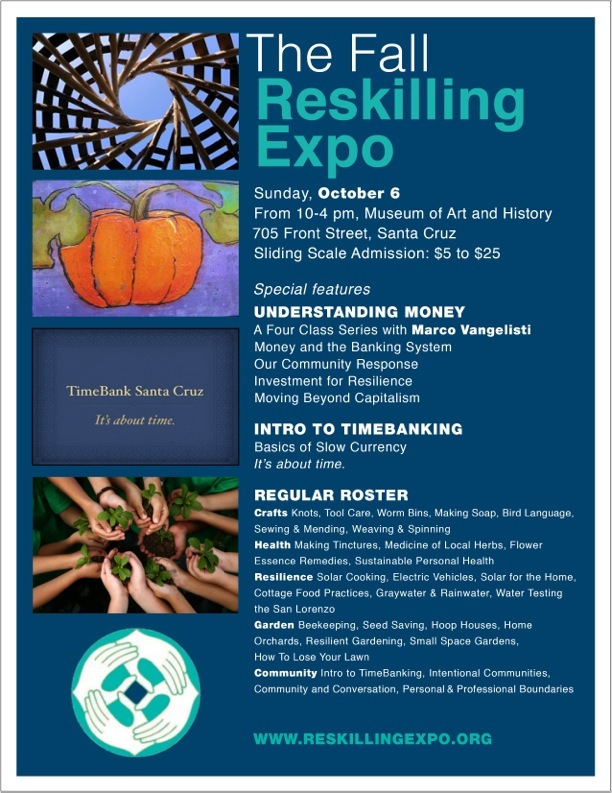 The Reskilling Expo is registered with the IRS as an educational public charity 501(c)(3) corporation. Your donations are tax-deductible and support the Expo and its projects, the Santa Cruz Grows Seed Library and TimeBank Santa Cruz. Should a benefactor be willing to cover the basic costs of a day-long symposia (~$500), we’ll agree to host another such event.